I participated in an Ambassador Program on behalf of Mom Central Consulting (#MC) for Cardstore. I received complimentary cards and a promotional item as a thank you for participating. Have you created your holiday cards yet this year? Holiday cards are something I often slack on. I love picking out the card and placing some fun and cute personal pictures. I even usually have them all picked out and ready to go. Where I fall short most of the time is actually sending them out. For some reason I just procrastinate so long that it becomes too late. For my family that I see I will give them a card by hand delivery, but if I don't see them during the holiday then they don't always end up getting a card. There are a couple of problems with that. Of course the fact that I didn't send the card means they miss out on my beautiful cards, and yes I always pick beautiful ones. And another problem is I end up with a bunch of cards not used. But not this year! I will get my cards ordered and mailed on time. One big reason is Cardstore.com. Cardstore has so many great holiday designs to choose from. It is really easy to upload photos and try them out in different cards. Then once I am done and happy with my choice I can allow Cardstore to do the rest. I can upload the names and addresses of my friends and family. Cardstore will then print them up, address them, and get them mailed out right away. This completely lets go of one step. They don't have to go through me first. You might remember that I made a card just to see how it would go recently. I received the card in the mail along with a couple of envelopes with my return address already printed on them. I used some of the fun football photos we took at a friends house. I love how it turned out. 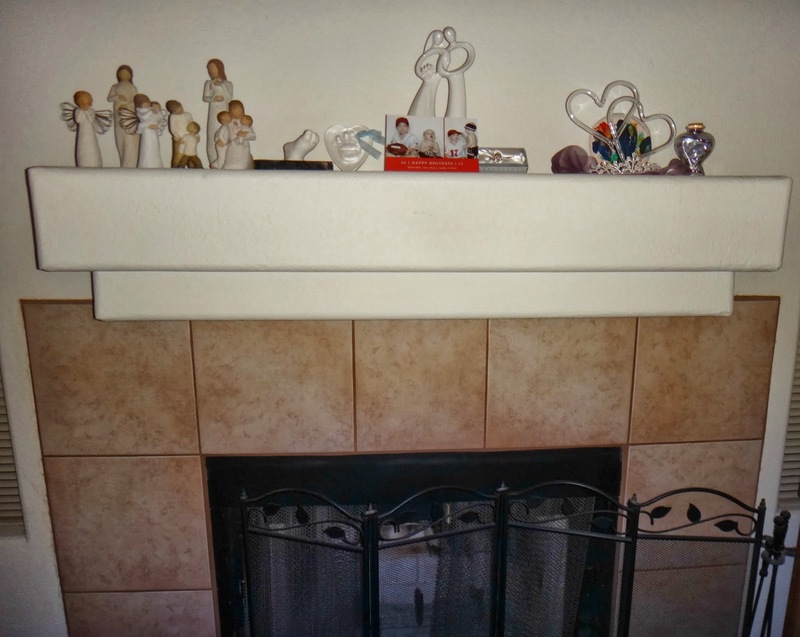 It definitely deserves to be at the Top of the Mantel. The card really outshines and looks beautiful on the top of our fireplace mantel. You can create your own personalized cards too. Then you can have them mailed to your friends and family or just to you so you can mail them. I also like that even if you have them sent to yourself, Cardstore will add a return address on all your envelopes for you. I LOVE to send holiday cards, especially photo ones; We have so many family and friends who live out of town and don't get to see our family much. I'll have to check out Cardstore! 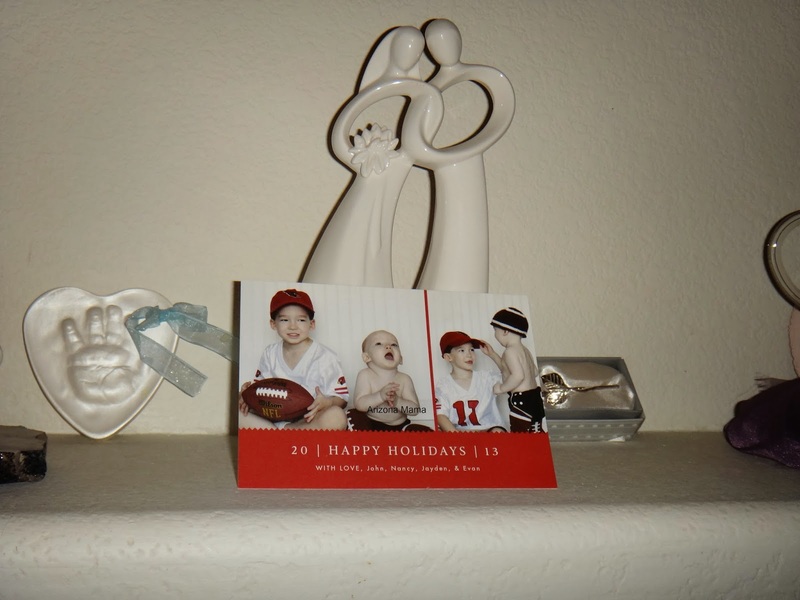 I just ordered my holiday cards a few days ago and can't wait for them to arrive so I can mail them out! I absolutely love sending and receiving Christmas cards!! Yah!! This has to be the easiest way to send out Christmas cards EVER! I love it! I love sending out Christmas cards. I am not doing it this year because I just cannot find the time to sit down and work on them, but I do have some other events coming up soon. Thanks for sharing this company. I had not heard of them before. I had no idea that you could order cards and have them actually mailed out for you! I may be too late this year, but I will do this next year. I love to send them out, but it takes forever to do it myself, time I could spend doing something else!